Arizona is a beautiful destination for motorcycle riders everywhere. With plenty of roads, gorgeous scenery, and beautiful weather, the state is a mecca for motorcyclists, as well as other tourists. Unfortunately, this can also mean more injuries. Motorcycle accidents tend to be more violent than passenger car accidents because motorcycles lack the metal frame that cars have to provide more protection for the rider. When you or a loved one are involved in a motorcycle accident in Maricopa county, you need the representation from a Phoenix motorcycle accident attorney at Knapp & Roberts. We offer clients FREE initial consultations and work on a contingency fee basis to ensure we don’t get paid until you do. Call us today for a free consultation! What do I do if I’m injured in a motorcycle accident? What compensation can I expect from my motorcycle accident case? Are there significant differences between motorcycle and passenger vehicle accidents? What are Arizona’s helmet laws? Is my motorcycle accident a common one? Is the cause of my motorcycle accident common? Have You Been Injured in a Motorcycle Accident in Phoenix? Arizona’s open highways and national park destinations encourage road trips of all kinds. While exploring Arizona by motorcycle can be exhilarating, it unfortunately comes with extra dangers and significant risk. Motorcyclist are extremely vulnerable to serious injuries as motorcycles lack many of the basic safety features of other vehicles; no airbags, no seat belts and the lack of a crumple zone. If you have been a victim of a motorcycle accident in the Phoenix area, recovering from your injuries can be a long and difficult process. When filing a claim, it’s unwise to deal with insurance by yourself. A specialized Phoenix personal injury lawyer at Knapp & Roberts law firm has years of experience handling cases such as these, and will fight on your behalf for fair compensation. If you or a loved one has suffered a serious injury after an accident in Arizona, a qualified Phoenix motorcycle accident attorney on our team can help ease the burden during the recovery. If the crash was caused by another driver’s negligence, you deserve justice and compensation. Don’t go at it alone, call an accident attorney at Knapp & Roberts for a free consultation; our dedicated team will fight to make sure you are compensated fairly. When a motorcycle accident occurs, the injuries are often major and need extensive medical treatment and ongoing therapies. Road rash treatment, broken bone repair, and surgeries are commonly needed after a motorcycle crash. These medical treatments can be expensive and take a long time, not only amassing large medical bills, but making it difficult to continue working and pay the bills while in the hospital recovering. The motorcycle accident attorneys at Knapp & Roberts are available to help you get the settlement you need to get your life back on track. Contact us today to discuss your options for compensation for your motorcycle accident. Motorists cannot deny a motorcycle from using a lane. Motorcycles cannot pass a vehicle in the same lane of traffic. Motorcycles cannot split traffic lanes. Anyone younger than 18 must wear a helmet while riding a motorcycle. Motorcyclists must wear protective glasses, goggles or a transparent face shield while riding a motorcycle. Motorcycles must contain secure seats and footrests for both driver and passenger, plus a rearview mirror to be rideable on the roadways. The law regulates the noise level and exhaust system of the bike. Operators of a motorcycle must have a motorcycle endorsement (Class M) to drive a motorcycle. Because motorcycles are a lot smaller than passenger vehicles, they take up less space on the road and need less fuel. Their more eco-friendly nature makes them a popular choice with people looking to reduce their carbon footprint. These considerations make them a great vehicle for traveling with a small number of passengers. However other safety concerns come into play. Riding a motorcycle takes skill and special training, and should not occur without this training and the proper license. All motorcyclists in Arizona require class “M” licenses, acquired only after taking special motorcycle tests. You have to be at least 16 years old for a class M license. As an adult motorcyclist, the law does not require that you wear a protective helmet. Only operators or passengers under the age of 18 must wear helmets. Motorcycles must have seats, footrests, and at least one rearview mirror. Passengers are only allowed on motorcycles with seats for extra people. Motorcycles can use entire lanes. No driver may infringe upon a motorcycle’s right to a whole lane. Two motorcyclists may ride abreast in a single lane if desired. Motorcyclists may not lane-split in Arizona. Lane-splitting refers to cutting between lanes of traffic. As of February 2018, lane-splitting is still illegal in Arizona, although SB 1007 could change that in the future. After a motorcycle crash, police will question whether the other driver, the motorcyclist, or a third party broke a roadway law that caused or contributed to the accident. Breaking a roadway rule is an act of negligence that could lead to liability for damages. The best way to stay predictable on the road and avoid liability for a crash is to obey all of the state’s motorcycle laws. Breaking a law, however, might not mean you’re entirely at fault – talk to a Phoenix motorcycle accident attorney about comparative negligence rules in Arizona. Note that in most cases a defendant could not hold your lack of helmet wearing against you during a motorcycle injury claim. Since Arizona law does not mandate that you wear a helmet, the defendant could not use this as proof of your own comparative fault for your head or brain injuries. This would only be a viable strategy if you broke a law by failing to wear a helmet. When riding a motorcycle, appropriate gear can make all the different between a fatal accident and lesser injuries. Wearing a motorcycle helmet is the single most important factor to preventing head injuries in an accident. Approximately 50% of motorcycle riders opt to wear a helmet. Only 40% of those injured in an accident chose to wear a helmet at the time. The latest research by the CDC shows helmets reduce motorcycle fatalities by up to 42% and brain injuries by up to 69%. In Arizona, only riders under the age of 18 are required to wear a helmet when riding a motorcycle. All other riders of any age must wear protective goggles, glasses or other transparent face shield, unless the motorcycle has a permanent windshield. Everyone knows how much more vulnerable you are on a motorcycle compared to a passenger vehicle; on two wheels, one pothole or improperly taken turn can spell disaster. The susceptibility to head injuries, especially when not wearing a helmet, is the most significant danger. Research shows that wearing a helmet is 37 percent effective for preventing fatal head injuries. In Arizona alone, the National Highway Traffic Safety Administration estimates the 38 fatalities were prevented by helmet use and another 32 could have prevented if 100 percent of the riders wore a helmet. According to the most recent data, there are approximately 192,000 registered motorcycles in the state of Arizona. The neighboring state of California has nearly 800,000, so it is likely that a large volume of out of state motorcycle riders travel through the Grand Canyon State every year. There were 3,189 accidents involving a motorcycle in Arizona in 2014, fewer than two percent of all motor vehicle crashes in the state. However, the rate at which those accidents were injurious or fatal was exponentially greater compared to all other vehicles. The 127 motorcycle related fatalities accounted for nearly 30 percent of total motor vehicle fatalities At the same time, nearly 80 percent of Arizona motorcycle accidents involved injuries (2,530); while fewer than 33 percent of passenger car crashes resulted in injuries. 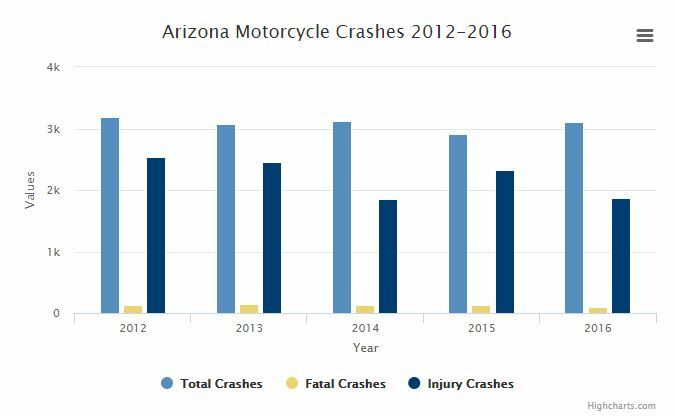 In Arizona during 2017, 2,907 motorcycles crashed. And of these, 156 crashes led to fatalities. Concerning location, 76.09% of these crashes happened in urban areas, while only 23.91% happened in rural areas. Of these accidents, 1,956 happened during daylight conditions. Only 642 happened after dark, on a lit road. The highest number of accidents happened on the dry road, while no crashes occurred during snow and frost. Drivers in the age category of 25 to 37 years old accounted for most of the Arizona motorcycle accidents, and 84.07% showed no signs of impairment at the time of the accident. There are many different types of motorcycle crashes, and some are more common than others. Vehicles on two wheels are naturally less stable than vehicles on four wheels. So, although they offer riders more freedom, they are also more dangerous. Riders should wear protective gear in case of an accident. Of the drivers involved in an Arizona motorcycle crash in 2017, 42.73% of riders managed to walk away with only minor injuries. Another 15.13% walked away with absolutely no injury at all. Accidents are just that – accidents. They are not avoidable 100% of the time. Wearing protective gear ensures that, should the need arise, the safety gear can mean less severity of injury if an accident were to occur. Unsafe lane changes mean that a motorcyclist weaves in and out of traffic. A car needs to occupy almost the entire lane on the road, while a motorcyclist can zip around and between cars at a faster rate of speed. If the motorcycle enters a blind spot for the passenger car, it can lead to an accident for both parties. Drivers parked on the side of the road need to open their car doors to get out of a parking spot. Unfortunately, not all drivers look to see if it is safe to do so, “dooring” a motorcyclist and causing him or her to crash. In a case like this, the driver usually goes flying through the air and the results are not pretty. Sudden stops can cause a motorcycle ride to come to a crashing halt. Stopping the bike too quickly can lead to ejection and tons of injuries. Motorcyclists have been found in trees and far away from their bike after a sudden stop. To avoid this, keep plenty of room between the motorcycle and the car in front of the bike. Forty-two percent of all accidents between a car and a motorcycle occur when a car makes a left-hand turn. This type of accident happens frequently in car accidents, but because the motorcycle is so small, it is easy for a driver not to see a motorcycle in the mirrors. Normally, the vehicle making the left-hand turn is responsible for the accident, unless the driver of the motorcycle is engaging in risky behaviors such as speeding or shifting lanes too quickly. Speeding is a huge factor in motorcycle crashes everywhere. The small size of the motorcycle makes it easy to travel at speeds much faster than a car, and for longer periods of time. But the faster the rate of speed, the worse the injuries in an accident. Lane splitting is when a motorcycle drives between lanes of usually slow-moving cars. In the case of a traffic jam, the smaller size of the motorcycle allows the driver to maneuver between the lanes of halted vehicles. Passenger cars do not have this same capability. Lane splitting is legal in some cases and in some states, so the fault of the accident depends on the laws in the area where the accident occurred. Arizona does not permit lane splitting and considers it illegal, but two motorcycles may travel side by side in the same lane if they both consent. Head-on collisions are when a motorcycle collides with another moving vehicle. 56% of motorcycle deaths occur in head-on collisions. About 76% of the time, the car strikes the motorcycle in the front, causing the driver separation from the bike. Most of the time this results in severe injury or death. When a motorcycle accident happens, for any reason, an attorney can help you determine if someone may be at fault, and if you can obtain compensation. The experienced Phoenix motorcycle accident attorneys at Knapp & Roberts are here to help you navigate the complicated process of filing for compensation for your motorcycle accident.